Woo Hoo! 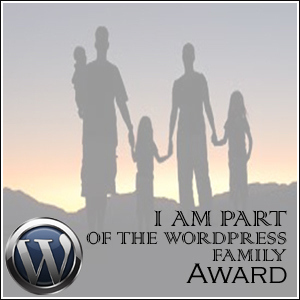 I am so excited because recently I was awarded the WordPress Family Award three times ~ and I apologize for not having responded before now. My huge hugs and gratitude go to the following amazing bloggers who nominated me with their posts ~ you have no idea how much I appreciate your thoughtfulness. My congratulations to you on your own nominations! So in no particular order, please take a moment to congratulate my list of bloggers ~ they are a special part of our WP Family Community! I took the liberty of doing more than 20 since I had been awarded 3 times! Enjoy ~ Send Out Love ~ Shine On! Yes, we are a family now. No longer faces in a crowd or story bites online. We are slowly becoming this real community. I hope we can continue to support one another. Congratulations on your award…so deserving indeed. Family means a lot to me. As do you! My feelings exactly ~ A la familia! Thank you so much! If only my real family was as nice as the ones I’ve acquired at WP! Oh I agree HEARTily! ♥♥♥ Congrats to you! Congrats on the WordPress Family Award! Thank you for nominating HoB for this award. Much appreciated! So proud of you! This is solo deserved by you because the joy that you have brought to so many deserves to be recognized and applauded. You have certainly inspired me, made me think and cheered me at times I needed it most. I look forward to exploring your other blogger family members! Shine on!! Congrats to you! Thank you so much for nominating my blog. I am honored! Thank you so much…I am so touched by this award. Congrats and thanks so very much for the FAMILY addition and award!! 🙂 XOXO! Hey, Yvonne, thank you for the award. It’s a gift to be a part of the WP family with you. I appreciate your inspiration. (Sorry about the little faux pas on my post today – it has been corrected!) Keep creating your beautiful art and posts! What a great award. Congratulations!